Israeli soldiers abducted, on Tuesday at dawn, fifty-four Palestinians from several parts of the occupied West Bank, including 33 in Jerusalem, after invading their homes and violently searching them, the Palestinian Prisoners’ Society (PPS) has reported. 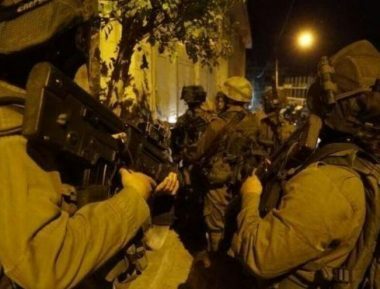 In occupied Jerusalem, the soldiers abducted 33 Palestinians, including several children, during extensive and violent searches of homes in al-‘Isawiya town. They have been identified as Issa Mohammad Abu Ryala, 16, Mohammad Zakariya ‘Oleyyan, 17, Shai Mohammad Atiya, 17, Samir Akram Atiya, 15, Abdullah Abu ‘Assab, 16, Mohammad Mahmoud ‘Oleyyan, 16, Wisam Sameeh ‘Oleyyan, 15, Mohammad Ali Dari, 14, Adam Kayed Mahmoud, 17, Nassim Kleib, 17, Yahya Arafat Dirbas, 16, Yousef Bilal Abu al-Hummus, 19, Daoud Yousef ‘Atiya, 19, Bashar Mohammad Mheisin, Ashraf Wael Obeid, Abdul-Qader Mohammad Obeid, Mohammad Abu Sneina, 18, Nassim Sami Moheisin, Mahmoud Mohammad Abu ‘Oweiss, Ahmad Abu Roomi, Mahmoud ‘Assem Obeid, Anas Abu Assab, Mohannad Nasser Mahmoud, Nidal Mahmoud, Issa Nasser Mahmoud, Hamed Shafiq Obeid, Mahmoud Shafiq Obeid, Mohammad Shawkat Obeid, Bashar Mahmoud, Rashad Abu Ryala, Saleh Na’im Mheisin, Amir Khaldoun Mustafa and Ma’moun Mahmoud. The soldiers also abducted Mohammad Khaled Tari and Midhat Mahmoud al-Jamal, after invading and searching his home in Beit Surik village, northwest of Jerusalem. The PPS office in Bethlehem said the soldiers abducted Abdul-Karim Ayyad, 56, Eyas Ahmad Farahin, 21, Yousef Mohammad ‘Adawi, 31, from Deheishe refugee camp, south of the city. It added that the soldiers abducted Ahmad Qassem Sheikh, 54, from Marah Rabah village, south of Bethlehem. In addition, the soldiers invaded Doha town, west of Bethlehem, and violently searched the home of a lawyer and the head the Independent Commission for Human Rights in southern West Bank, Farid al-Atrash. The army also invaded and searched a print shop in the Salam neighborhood, in Deheishe refugee camp. In Jenin, in northern West Bank, the soldiers invaded homes in the city, and Jenin refugee camp, and ransacked them before abducting six Palestinians, identified as Ibrahim Jabr, Farhan Yassin Sa’adi, Ahmad Abu Zeina, Lutfi Mohammad Abu an-Nasr, Jom’a Abu Jabal, and Samar Mo’tasem Sa’id. It is worth mentioning that Lufti has a physical disability after the soldiers previously shot him. In Nablus, in northern West Bank, the soldiers abducted Mo’tasem Mohammad, 18, Mohammad Khweira, and Majdi al-Qutub. The soldiers also invaded homes in Saida village, north of the northern West Bank city of Tulkarem, before abducting Samer Rasim al-Ashqar and Saddam Raddad. In Ramallah, in central West Bank, the soldiers searched a few homes, and abducted Mahmoud Abdul-Latif Hammad, Amir Maher Hamed and Abdul-Qader Kayed Hamed. Furthermore, the soldiers invaded many homes in Bani Neim, Sa’ir, Doura, Beit ‘Awwa, and ath-Thaheriyya towns, in the southern West Bank governorate of Heron, in addition to Jouret Bahlas, north of Hebron city, and installed many roadblocks, before stopping dozens of cars and interrogated the passengers.